Our PaleoKits are made daily and vacuum sealed for same day freshness. Our athletes swear by them for optimal performance and health. Get a full refund if you are not 100% satisfied. Proceeds go to Steve's Club, A 501(c)(3) NJ Non-Profit Organization. Our mission at Steve's Club (A 501c3 NJ Non-Profit Organization) is to provide excellent coaching, community, support, and guidance to the young teens (aspiring for greatness) of Camden, NJ. 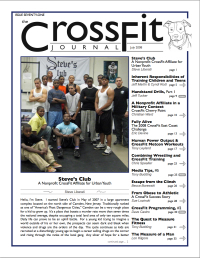 Steve's Club is a proud CrossFit and CrossFit Kids affiliate. It’s great seeing old members come back to visit Steve’s Club. Eduardo Polo Troche joined the Marines 4 years ago and recently completed the Police Academy. 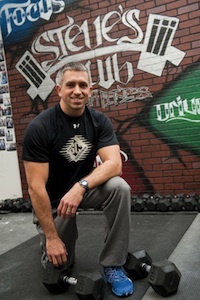 He now has a daughter named Maisie and decided to come back to Steve’s Club to get back in shape and workout with his brother Isiah. The greatest discovery any outsider could make about Camden is it's overriding response to failure: If it didn’t work last year, do it AGAIN this year (and if possible do it MORE). Every year they pass more laws, hire more police, build more prisons, and sentence more offenders for longer periods-all without moving one inch closer to “ending” crime. If it didn’t work last year or the year before that or the year before that or the year before that, but you can be sure we’ll try it again this year, knowing beyond a shadow of a doubt that it won’t work this year either. Every year they spend more money on schools, hoping to “fix” whatever’s wrong with them, and every year the schools remain stubbornly unfixed. Spending money didn’t work last year or the year before that or the year before that, but you can be sure we’ll try it again this year, knowing beyond shadow of a doubt that it won’t work this year either. Every year they try to make the criminals go away, and every year they remain with us. We couldn’t shoehorn these criminals back into the “the mainstream” last year or the year before that or the year before that or the year before that, but you can be sure we’ll try it again this year, knowing beyond a shadow of a doubt that it won’t work this year either. Maybe its time to TRY something DIFFERENT. Afterall, IF Camden is saved, it will not be saved by old minds with new programs but by new minds with no programs at all. Much of my inspiration comes from Daniel Quinn in "Ishmael."